It doesn’t get much better in St. Louis than going to a Cardinals game with free parking, a fun meet-up bar and restaurant, and a complimentary shuttle! 1860 Saloon, Game Room & Hardshell Café is the perfect destination before and after baseball. First, if driving, arrive early and park free in Historic Soulard, either in our lot across from 1860s or along the neighborhood streets. This gives you and friends time to enjoy a meal or appetizers with refreshing beverages, served by our friendly staff. Once you’ve arrived, there are three rooms (with one menu) at 1860s to spread your Cardinals team spirit. In the 1860s Saloon, with its antique wood back bar, live music with no cover charge is enjoyed 365 nights a year and weekend afternoons. Blues, Classic Rock and Motown performances ensure great entertainment. In the second room, groups converge at the 1860s Game Room bar for sports on the screens, foosball, video games, shuffleboard and darts. It’s the perfect atmosphere for drinks, St. Louis-style pizza, and listening to TouchTunes. Want traditional restaurant style seating? Room three, The Hardshell Café, with a New Orleans courtyard feel, is the place to be. From Cajun and Creole to traditional American fare, our menu items receive rave reviews. And if you don’t have time to eat at 1860s, did you know you can take our popular Homemade Chicken Strips with you to the ballpark? Unless your tickets are in an all-inclusive area, food is allowed to be brought in. The Chicken Strips pair well with the stadium’s beverage choices! 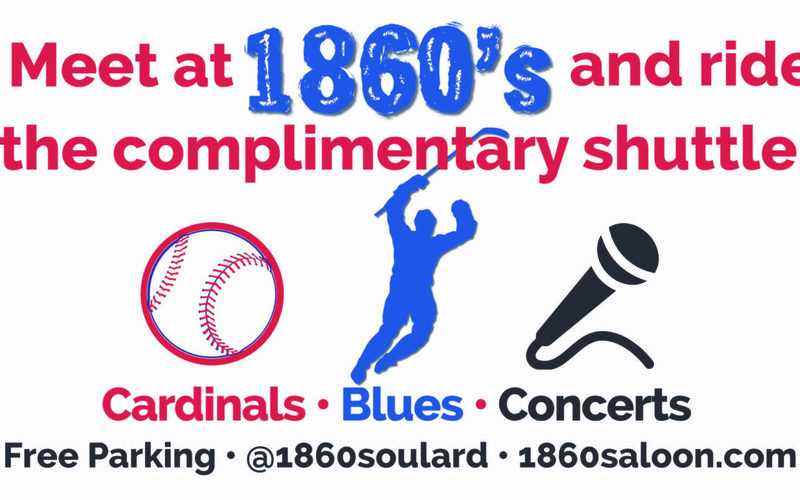 Finally, when you are ready for Busch Stadium, Soulard Joel, is ready to drive you there, stress-free, in the 1860s complimentary shuttle. Joel starts 90 minutes prior to games. He drops off and picks up near the East entrance, on Spruce at Broadway, making it a convenient walk. We look forward to being a part of your Cardinals game experience, with free parking, serving scrumptious food and drinks at a great price, and a ride to and from the game. 1860s: Where fun happens!